Ok, you’ve got your fuzz, your overdrive, your distortion and your clean boost. That’s all, right? Wrongo. The treble booster is an almost-forgotten member of the distortion family, and without it we wouldn’t have such classic tones as Black Sabbath’s ‘Paranoid,’ pretty much all of Led Zeppelin 1, and everything Brian May’s ever done. So what’s a treble booster and why is it different to just turning up the treble knob on the amp? Well not quite a fuzz, not quite an EQ, treble boosters were typically based on very simple circuits and they promoted the idea of boosting the strength of the signal to the amp while tailoring its tone curve to attain maximum tonal goodness. 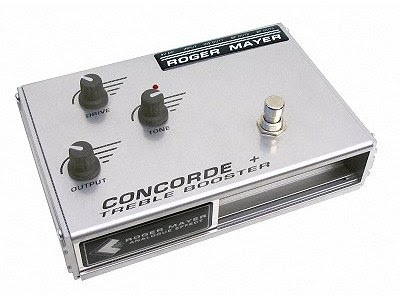 The Concorde +, like the other pedals in Roger Mayer’s Vision Series, has controls for Drive, Tone and Output, a sturdy and stompworthy footswitch, twin buffered outs and a hardwired bypass out, an input, a slidable battery cover and a super-strong casing. The electronics combine a low noise class A silicon drive circuit with passive tone shaping to drive a fully optimised germanium treble booster, allowing you to add drive and distortion with EQ before the actual treble booster section – think of it kind of like two pedals in a signal chain, which you can balance for the perfect interaction. Mayer notes that you can also set the silicon drive section to drive the treble booster section much harder than any guitar pickup could ever do, without any added distortion but with the added feature of having EQ prior to the treble booster, so you get the qualities of soft germanium type distortion overload characteristics or more radical germanium distortion sounds. Using an alder-bodied, Bigsby-loaded Ibanez Talman with vintage-output Ibanez Super 58 pickups, I flipped to the neck pickup and unleashed my inner Iommi for some ‘Paranoid.’ With a setting of about 3 o’clock on the Drive control and 2 o’clock on the Tone, there was just enough dirt and grizzle around the notes but still punch and definition on the low end. If you turn up the Drive a bit further you get a fuzzy buzz between the notes which works great for sludgier riffage. There are also some great Jimmy Page tones available. With everything set to the midway point the Concorde + is perfect for ‘Whole Lotta Love’ and ‘Communication Breakdown’ – that barky, aggressive tone which begs for you to alternate between muted chugs and chord stabs. Wind back the Drive control a little for a bright, punchy clean tone which begs for heavy gauge strings and single coil country licks. The Concorde + isn’t just for the player who wants to get closer to those classic Page, Iommi and May tones; it’s for the experimentalist seeking new levels of tone control, or anyone looking for a different character to their overdrive and distortion. Here’s a little audio demo of the Roger Mayer Mongoose X (with a simple little image thrown in). I used my project Telecaster copy for the guitar in the left channel, and my Ibanez UV777BK for the other guitar parts. The amp is my Marshall DSL50 through an AxeTrak isolated speaker cabinet, and I used Toontrack’s Drumkit From Hell and Digidesign Pro Tools. I came up with this little ditty just to demonstrate the Mongoose, but i like it so I kept writing. I’ll let ya know when I’ve recorded the rest. If you’re in Australia, you can buy Roger Mayer pedals online from Guitar Toys. Elsewhere, you can buy them from Tunnel Vision Music. CLICK HERE to see Roger Mayer pedals on eBay. Legendary pedal designer Roger Mayer says the Vision Wah Special comes from the same bloodline as a pedal he built 40 years ago for Jimi Hendrix. That may be so, but to think of this as just a foot-operated portal to Jimi’s patchouli-scented spirit is to sell it way short. Visually, the Vision Wah Special borrows a little bit of the science fiction vibe of Mayer’s famed spaceship-shaped pedals. There are two side mounted knobs, but the sleek design dispenses with any writing whatsoever on the visible part of the pedal. Instead you have to flip it over to see “Roger Mayer Vision Wah Special – Handbuilt in the UK” and that the knobs are labelled Wah Sweep and Wah Blend. Closer inspection of the pedal base also reveals a tiny hole leading through to a trimpot inside the pedal, which allows you to set a minimum volume for when the pedal is in bypass mode: when you’re not using the wah effect, the unit functions as a volume pedal. However if you don’t need the volume pedal option, you can simply turn it off by moving a jumper on the PC card. The wah effect itself is engaged via a switch at the full ‘toe down’ end of the wah treadle, and if you’re worried that your Chuck Taylors will stomp the effect on when you’re using the volume mode, you can remove the base plate to find a small control on the PC card labelled SW Adjust, which sets the required bypass switch pressure. The treadle itself is smooth and comfortable, and relies on a clever vari friction nylon bearing, combined with a fully balanced top plate which allows the user to customise the tension from light to firm. The treadle will always remain exactly where you leave it, for those Michael Schenker fixed wah tones. As you’d expect from a pedal associated with Jimi, the Vision Wah can sound funky and earthy. 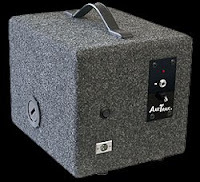 I found that at the most extreme end of the Wah Sweep control, the pedal cut through in a very sharp, bright manner especially suited to wild psycho soloing or clucky clean funk, while lower, more bass-heavy settings introduced a supportive, thick quality similar to Jimi’s soulful wah work, or the sounds of Alice In Chains’ ‘Dirt’ album. Somewhere around the upper middle of the Wah Sweep trajectory I was able to dial in a cool nasal Zappa ‘honk.’ Depending on the setting and how you play the pedal, it can go from a ‘wah wah’ to a ‘quoll quoll,’ ‘loop loop’ and ‘qua qua’ pedal. The Wah Blend control allows you to introduce the dry guitar into the sound, which is a great way of maintaining pitch clarity and the quality of your phrasing without having them be overwhelmed by the wah effect. The Roger Mayer Vision Wah Special is more than just ‘like the one Jimi used.’ It’s a modern update on the wah concept in general, and while its ability to recreate classic Hendrix tones is a great selling point, it’s just one of the things it does very, very well. If you’re in Australia, you can buy Roger Mayer pedals online from Guitar Toyz. If you’re not in Australia, CLICK HERE to buy the Vision Wah from Tunnel Vision Music. The latest edition of Australian Guitar magazine is on sale now. In this issue I reviewed the Indie Guitar Co Shape Natural guitar and the Roger Mayer Classic X pedal. I remember buying the very first issue of Australian Guitar when it first came out about 10 years ago, so it’s way exciting to be a contributor now. CLICK HERE to subscribe to Australian Guitar.